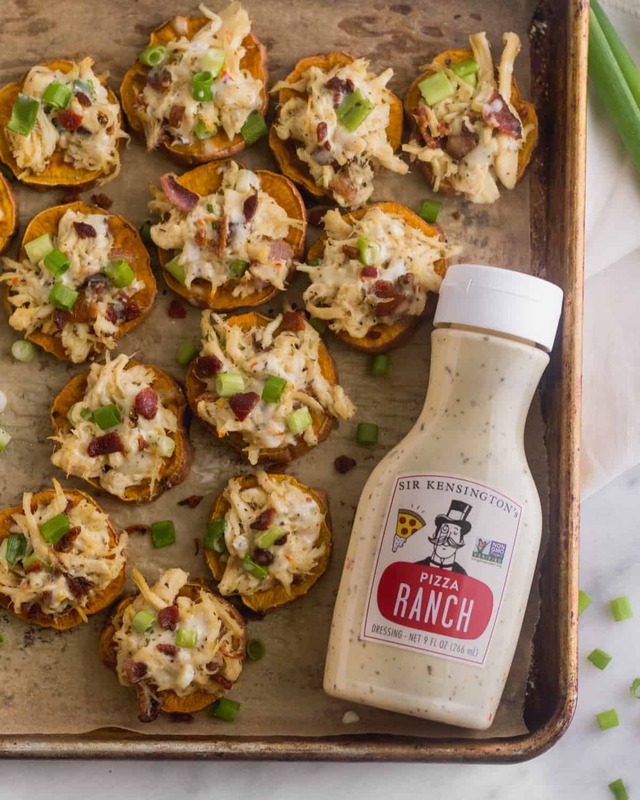 Chicken, bacon, & ranch on sweet potatoes rounds to make individual pizzas! 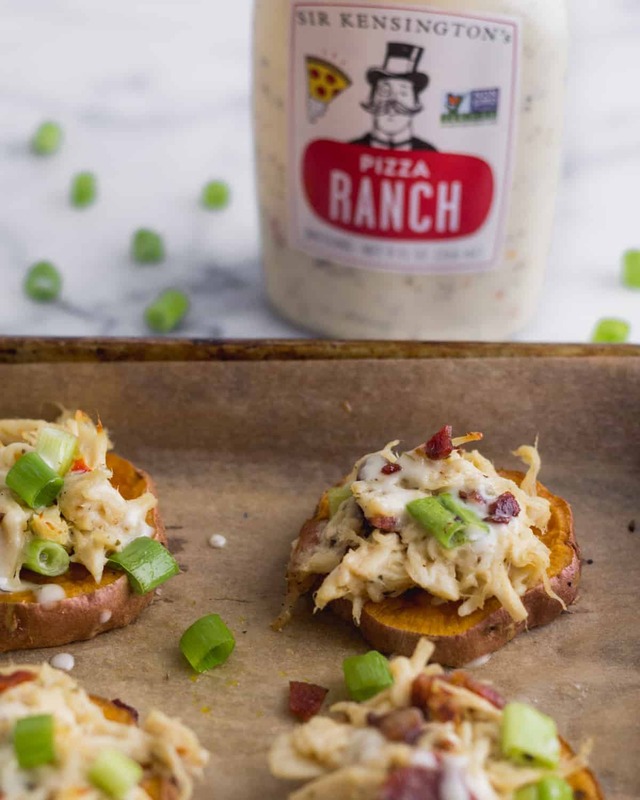 These Whole30 Chicken Bacon Ranch Sweet Potato Pizza make a healthy alternative to your typical pizza, are easy to make, and absolutely delicious. You only need 5 ingredients for this paleo, gluten & grain free, dairy free, and Whole30 dish! This post is sponsored in partnership with Sir Kensington’s. All opinions expressed (as always) are my own. I only partner with brands I trust and personally recommend – thank you for your support in helping make Eat the Gains possible! It wasn’t until college that I discovered pizza and ranch. And apparently it’s a huge thing. I went to a big party school (shoutout to JMU!! ), and with that partying came lots of late night eating. One of the freshman staples after coming home from a night of drinking was Chanello’s Pizza. I’m sure if I ate it now it wouldn’t be that great, but when you were drunk, it was glorious. And it always came with ranch that you could dip the pizza in. That’s when I discovered the pizza and ranch combo. 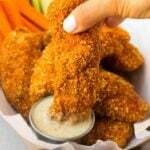 If you’ve read the blog before, I’ve talked about how I never grew up a huge ran of ranch. I was more the honey mustard kind of person. But Sir Kensington’s, who makes some of my favorite condiments, has a new line of ranch dressings. And it’s bomb. I find myself putting it on pretty much everything. They came out with a bunch of fun flavors, like classic with avocado oil, buffalo, and pizza ranch. When Michael and I first tried it we both agreed that it tastes exactly like when you dip your pizza into ranch. I don’t know how they did, but they nailed it. And best part is it’s made from real food ingredients, doesn’t have any added sugars, and is paleo and Whole30 approved. This recipe couldn’t be any easy. The key to make it come together super quickly is having some shredded chicken on hand. 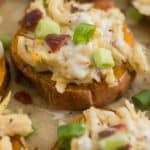 It’s a staple at our house and I usually make my crockpot/instant pot chicken once a week for quick and easy meals during the week. First you need to do is slice up some sweet potatoes and bake them. While those cook, make the bacon. I pan fried it, but you could also roast it in the oven it you really want to make the recipe hands off. Once the bacon is done, you crumble it with the shredded chicken, some green onions, Sir Kensingston’s Pizza Ranch, and salt and pepper. 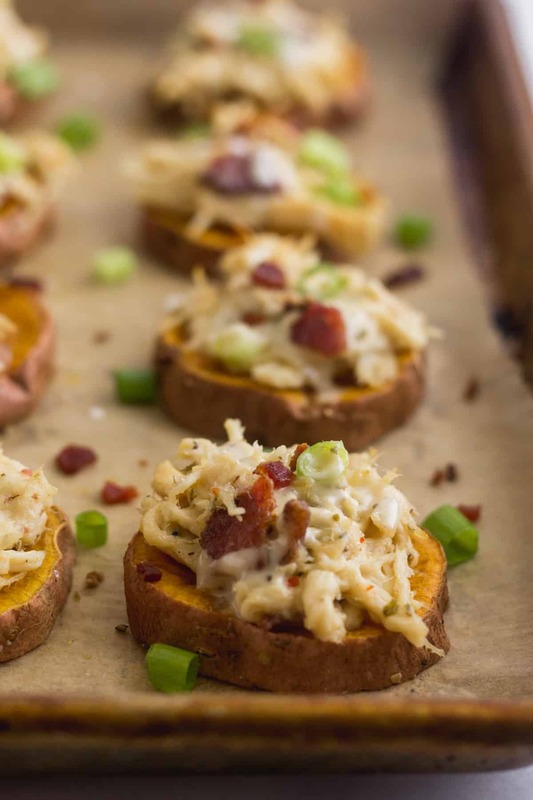 Once the sweet potatoes are cooked and golden brown, you add the mixture on top and pop it back in the oven for a handful of minutes to heat through. It’s as easy as that. And they are so good! I made them and there was a bunch of leftovers in the fridge. Michael texted me that he couldn’t stop eating them and probably ate like 15 of them haha! The guy loves pizza. 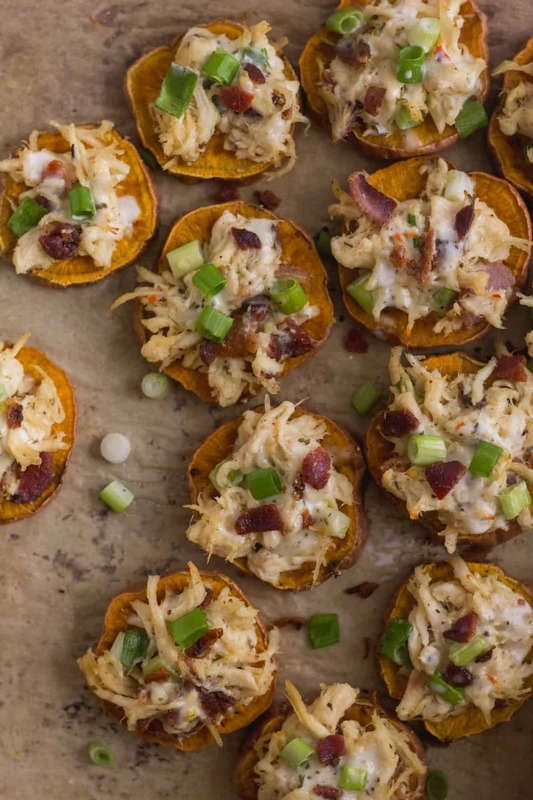 These chicken bacon ranch sweet potato pizza make a great easy appetizer, party food, or Friday night dinner. 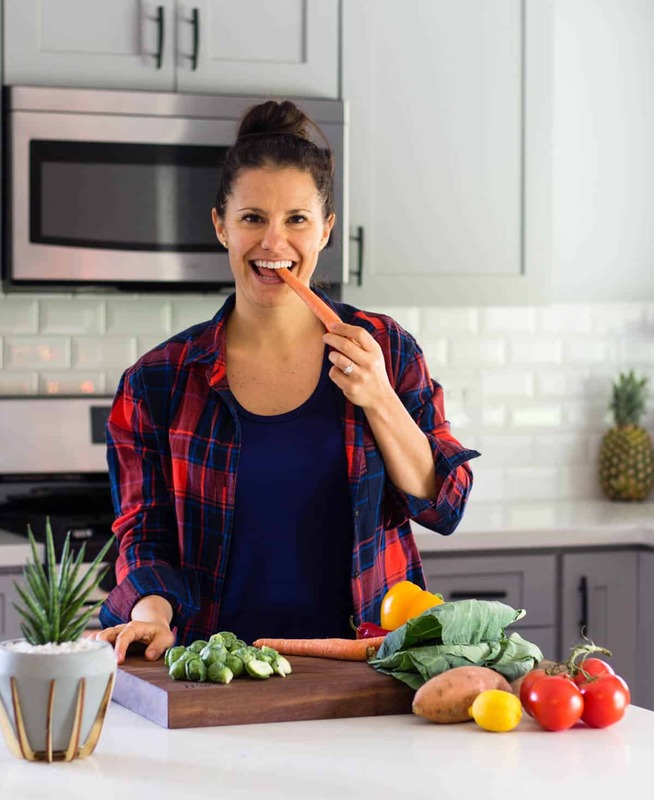 You can also make them for meal prep as they save well in the fridge for up to a week (if you can keep them that long!). Preheat oven to 375 degrees Fahrenheit. Line two large baking sheets with parchment paper. 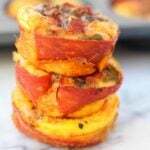 Toss the sweet potato slices with avocado oil and salt and pepper. Spread them out evenly on the baking sheets, with about 1 inch between slices. Bake for 20 minutes, flip, and then bake for 10 for minutes until golden brown. 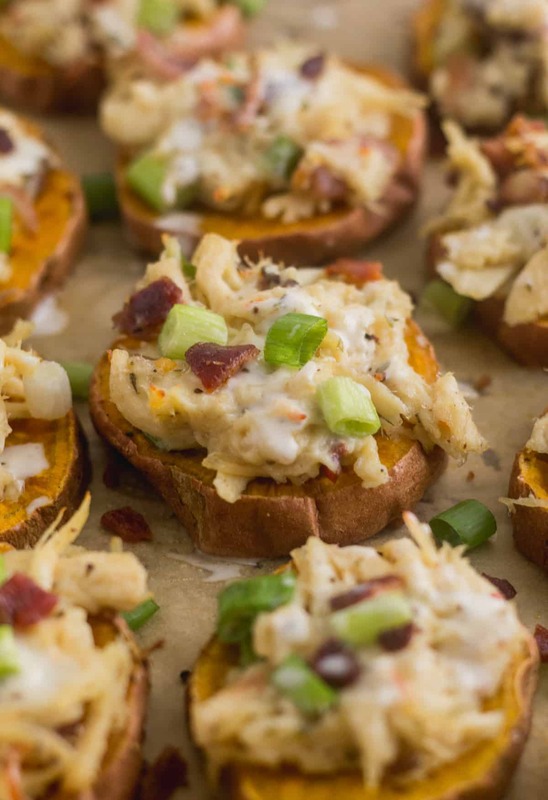 While the sweet potatoes bake, make the bacon. In a large sauté pan over medium heat, add bacon and sprinkle with pepper. Cook for 10 minutes, flipping once halfway through until crispy. Place on a paper towel lined plate and let cool. In a small mixing bowl, crumble the bacon. Add the shredded chicken, green onion, and ranch and mix until combined. When the sweet potatoes are done, top each round with the chicken mixture, dividing evenly. Bake for another 3-5 minutes until warmed through. Enjoy! the recipe looks delish. 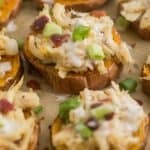 I want to be able to count the calories and am not sure how many calories in each sweet potato round pizza. Nutrition facts say 435. Is that divided by 4 for 4 servings? Or is it a high calorie snack? Hi Lynne! The nutrition info is for 1/4 of the whole recipe. 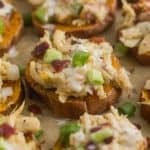 So if you make it according to the measurements in the ingredient list, 1/4 of the total number of sweet potatoes rounds will be the nutritional info listed. If you want to make it a snack, you can divide it by 8 or so. Hope that helps! This recipe was so yummy! Made it for the holidays and people loved it! These were delicious! I made them for the holidays and people loved them! I will for sure make them again. So glad you liked them Elsa! Happy holidays!! Incredible!!!! Can’t wait to make this again! So incredibly easy to make, and such a hit at our get together over the weekend! Yay, so glad everyone liked them! Thanks for trying Joe! 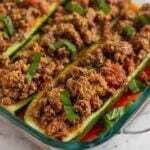 One of my favorite whole30 recipes! Easy and delicious! Yay, so glad you liked it Steph! Thanks for trying! Hi! I am excited to try this recipe. Quick question can I subsitute dump ranch for the ranch listed? I’m not sure where to find the ranch the receipe calls for. Yes, any ranch will work! You could mix it with a little bit of pizza sauce too if you want that pizza flavor. 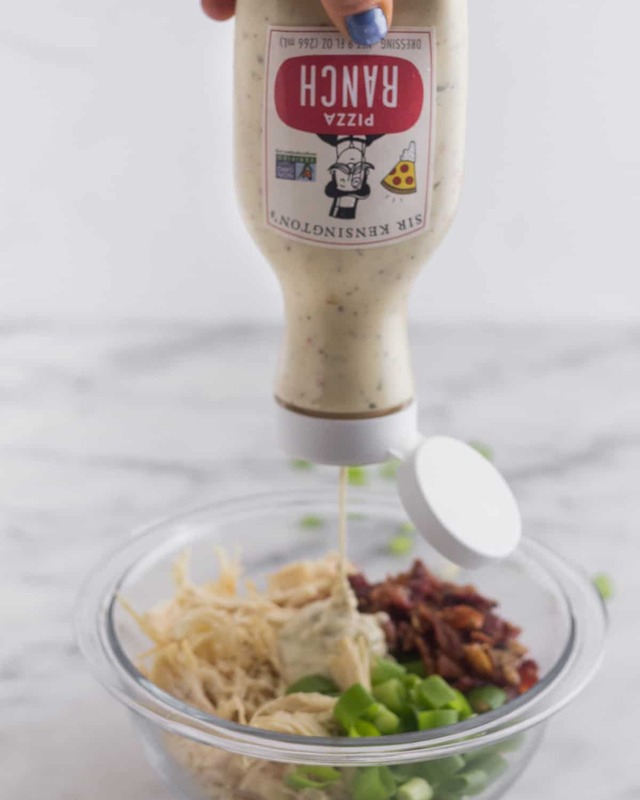 I got the ranch at Whole Food, but you can also get it on amazon – https://amzn.to/2T0ApHJ – let me know if you try to make them! I love simple and I love tasty! These were perfect for a fun meal for myself. I am definitely getting my hands on some of the pizza ranch in the recipe to try again. I subbed ranch and pizza sauce mixed together and it was great but am so intrigued by the actual pizza ranch 🙂 I have leftover chicken mix and potatoes for seconds or might use with lettuce. The pizza ranch is so good!! So glad you liked them Abby and thanks for trying them!